3/23/15 - Mason extrication, 1100 block E. Ash St.
Several departments came together to work a difficult extrication shortly before 6 PM on Monday, March 23, 2015. A car traveling west on E. Ash St went off a curve in the road, struck a driveway which caused it to go airborne, then struck a tree, impacting the roof as the vehicle was landing in a end-over-end rollover motion. When personnel first arrived they were able to remove two children from the back seat, but the driver was heavily entrapped. A second ambulance was requested by command, and Survival Flight was requested to respond for the driver. Careful extrication efforts by Mason firefighters and Ingham Co Sheriff Rescue personnel took approximately 35 minutes to free the trapped patient. 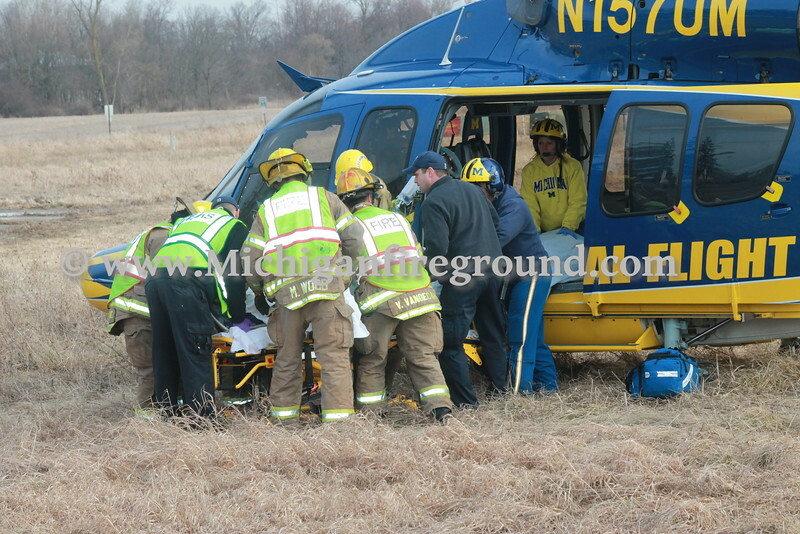 Mason firefighters set up an LZ approximately 1 block to the west, and the helicopter crew was already on scene assisting patient care when extrication was completed. Personnel from the Mason Police Department, Ingham Co Sheriff Department, Mason Fire Department, Lansing-Mason Area Ambulance Service, Delhi Township Fire Department ambulance, Ingham Co Sheriff Rescue and U of M's Survival Flight all worked together as one team to bring this potentially tragic crash to a successful ending. Media information released by officials reported that all 3 occupants of the car received non-life threatening injuries, they believe the crash was caused by the driver experiencing a medical problem.